BERLIN Former Deutsche Bank chief Josef Ackermann said Thursday he was stepping down from the board of Siemens AG following an argument over the appointment of a new CEO at the German industrial conglomerate. The announcement at an event in Berlin came less than a month after Ackermann resigned as chairman of Switzerland's Zurich Insurance Group days over the suicide of its finance chief. The 65-year old Swiss cited a "discrepancy in questions of style and fairness" as the explanation for leaving the Siemens board after more than a decade. German media reported that Ackermann opposed the replacement of Siemens chief executive Peter Loescher, who quit after the company announced it would not meet its 2014 profit margin targets. The Munich-based company declined immediate comment. Its board members are due to meet again next week. As one of Germany's top bankers before and during the financial crisis Ackermann drew much public criticism, and he has remained a divisive figure even after leaving Deutsche Bank last year. Last month he abruptly resigned as chairman of Swiss insurance firm Zurich after it emerged that its chief financial officer Pierre Wauthier had described his strained 15-month working relationship with Ackermann in a suicide note. "His accusations against me are incomprehensible," Ackermann said Thursday, insisting that his dealings with Wauthier had been marked by professionalism and mutual respect. But the long-time banker acknowledged that he believed Zurich wasn't performing as well as it should, and that he felt the company needed to be more transparent in its financial reports. "I also ... demanded that we paint a very honest picture, especially in the conclusions and don't just pretend that everything is going well," Ackermann said. "Anyone who knows me knows that I set the bar very high, also for myself." 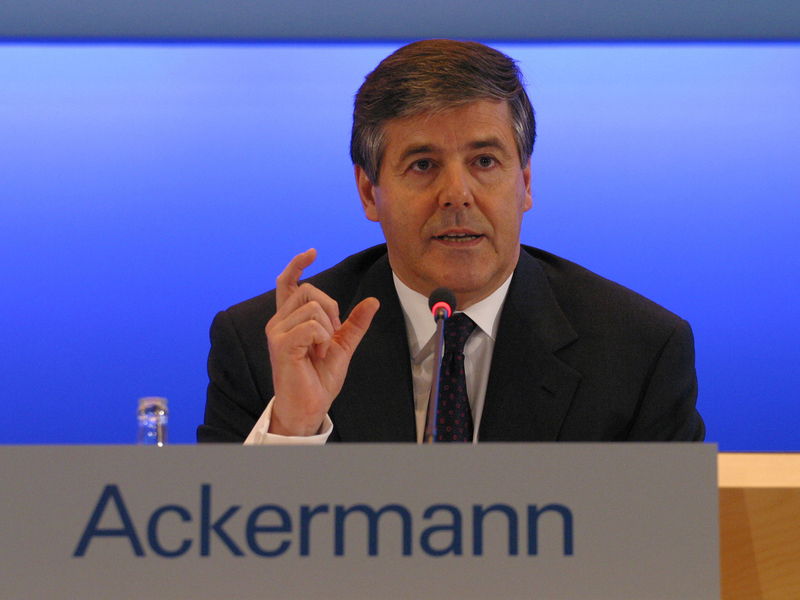 Ackermann said he would continue his other commitments, including his posts on the board of oil giant Royal Dutch Shell PLC and private equity firm EQT, as well as his role at the World Economic Forum. Siemens shares were down 1 percent at 87.18 euros in midday trading on the Frankfurt exchange.